The index opened weak on the back of bad global cues but saw the responsive buyer take control to move the index above 8100 and then closing positive at 8146.30, a small gain of 24.85 points. The broader market was just positive, with 818 advances to 743 declines. The range for the series is at 8000-8200. Call option 8200-8250 added huge 4.31 lacs OI with huge short covering seen at 8100 and below strike prices. Put option 8200-8100 added huge 21.87 lacs OI with profit booking seen at 8000 and below strike prices. Nifty Open Interest is at 1,10,90,150 down by 16,57,450, whereas Oct series added 39.02 lacs with increase in price, probably 100% rollover with huge long build-up. Bank Nifty Open Interest is at 15,08,725 down by 63,100, whereas Oct series added 2.01 lacs with increase in price, probably 100% rollover with huge long build-up. FII’s bought 1.76 lacs Futures, which includes 45058 contracts long build-up and 41536 contracts short build-up, with increase in net OI by 85694 contracts (includes 134866 longs to 131344 shorts for the day) and the average price per contract comes to around 8172.02. FII’s Index future open contract as on date is 229116 Longs to 118400 Shorts, net long 110716 contracts. 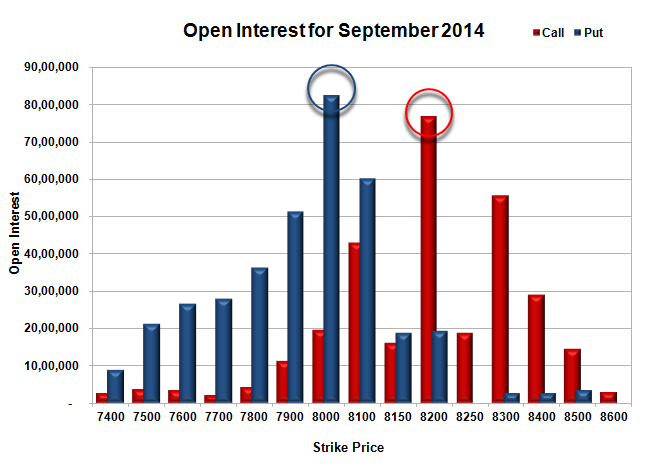 Initial support at 8100, with huge OI of 60.28 lacs and below that at 8000 with highest OI of 82.37 lacs. 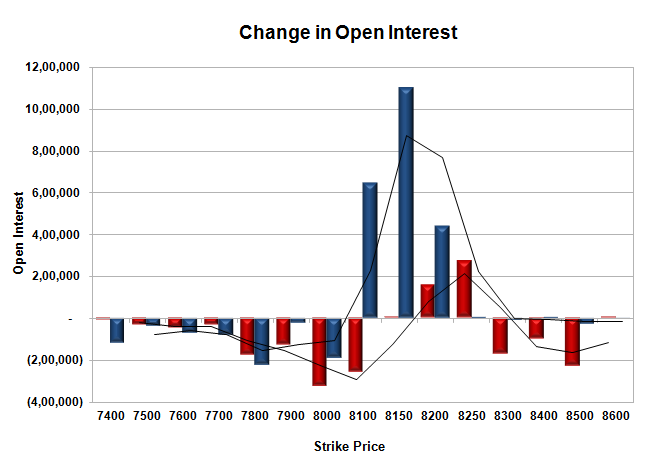 Initial and best resistance still at 8200, with huge OI of 76.80 lacs and above that at 8300 with huge OI of 55.63 lacs. 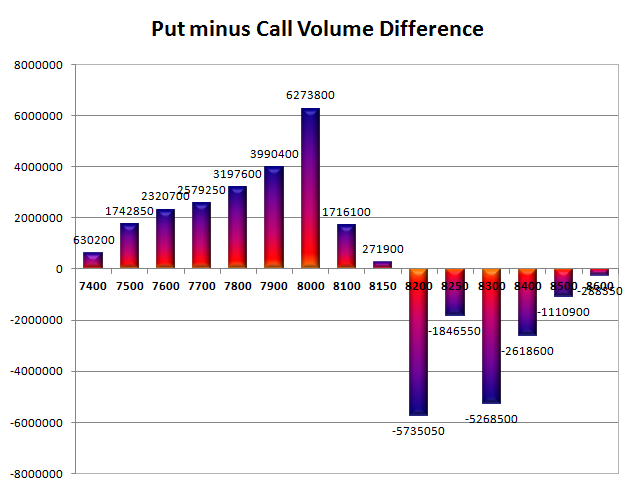 Day Range as per Option Table is 8068 - 8189 and as per VIX is 8097 - 8196 with 8124 as the Pivot.